In Sahaptin, the word for salmon used in sacred ceremonies is “wy-kan-ush.” Also in Sahaptin, the word “pum” means “people.” The tribal cultures in the Columbia River Basin could rightly be called Wy-Kan-Ush-Pum or “Salmon People” for how completely these sacred fish shaped their culture, diets, societies, and religions. Visit the Celilo Longhouse on the banks of the Columbia River during their annual First Salmon feast and you’ll probably be struck by how much reverence is paid to the fish. There is the smell of cooking salmon hovering in the air, tantalizing visitors with its savory aroma. The longhouse throbs with ancient songs of thanksgiving for wy-kan-ush—songs that have been sung up and down the Columbia River for thousands of years. From the fishnets lying on the ground to the fish stories of tribal fishers, there is no question that salmon are at the center of this gathering. It is difficult if not impossible to come away from the First Salmon ceremony without seeing the salmon in a different light. Salmon are one of the most important aspects of tribal culture. To call salmon a staple of the tribal diet would be an understatement. Historically, the typical tribal member ate almost a pound of salmon every day, but salmon represented much more than a source of nutrition—they shaped our societies and our religions. From a tribal legend, we learn that when the Creator was preparing to bring forth people onto the earth, He called a grand council of all creation. From them, He asked for a gift for these new creatures—a gift to help the people survive, since they would be quite helpless and require much assistance from them all. The very first to come forward was Salmon, who offered his body to feed the people. The second to come forward was Water, who promised to be the home to the salmon. In turn, everyone else gathered at the council gave the coming humans a gift, but it is significant that the very first two were Salmon and Water. In accordance with their sacrifice, these two receive a place of honor at traditional feasts throughout the Columbia Basin. These ceremonies always begin with a blessing on and the drinking of water, followed by a prayer of thanksgiving on and the serving of wy-kan-ush, the salmon. 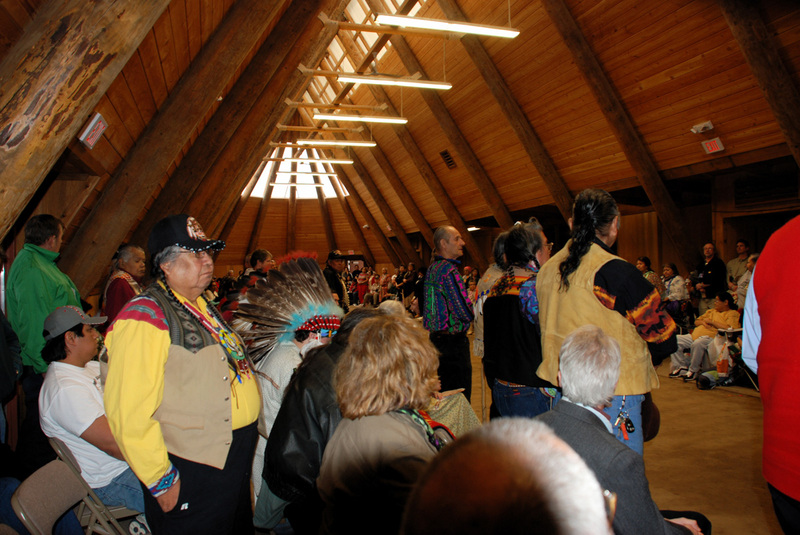 This ceremony reinforces the central role that salmon and water play in the health of Indian people and their culture. Fishing for salmon is just as integral an aspect of tribal culture as consuming it. For many, fishing trips shape their appreciation for the land, the waters, and the salmon. It is without question that salmon are worth our time, energy, and sometimes even risking our lives. That is why it was troubling when the number of salmon that returned up the Columbia River each year grew smaller and smaller. By the 1960s the numbers had dipped so low that tribal concern turned into alarm that we might lose our sacred fish. At that time, the tribes did not have the political voice or power to fight the decline. Fortunately those days are past. Today the tribes are doing everything in their power to make sure that salmon return to as many of their traditional waters as they can. Enormous amounts of resources are being poured into this effort, and tribal youth are joining the fight to save salmon. Every year, more and more tribal members are becoming fish biologists, environmental engineers, and other scientists who are offering their minds as well as their hearts for the protection of the salmon, the water, and ultimately, their traditional way of life. We can’t completely restore salmon alone, but the power of wy-kan-ush is reason for hope. The world over, salmon affect the cultures of the people in which they come in contact. The wildly different traditional cultures of Japanese Ainu, Pacific Northwest Coastal tribes, the Norwegian coastal areas, and the Russian Far East each have salmon returning to their lands and each share a reverence and gratitude for the bounty that salmon provide. The modern Pacific Northwest is no different. Salmon have shaped the culture of the newcomers to this region just as they shaped tribal cultures before them. Salmon are the icon of this place. They are valued as food, as a resource, and as a representation of the wildness and wilderness for which the Pacific Northwest is known. They shape our land use policies and power grid. Whether they realize it or not, every single person in the Northwest is a Wy-Kan-Ush-Pum. We are all Salmon People. Let us all work together to protect and restore salmon—this fish that unites us. The longhouse at Celilo. 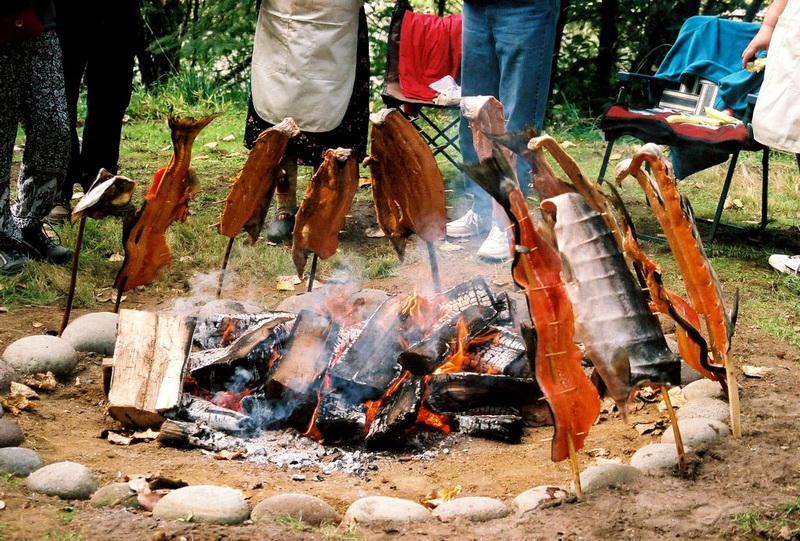 Salmon feasts and ceremonies have taken place next to the Columbia River for thousands of years. Salmon being roasted the traditional way over an alder wood fire.